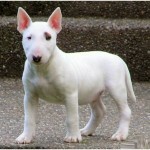 The Bull Terrier is playful, charmingand sometimes a mischievous dog. This is one of those dogs that never laze around. It is usually jumping around or running or exploring but not sitting down. Although it may be a rascal, it is very loyal to its owner[s]. A cross breed between a bulldog and a terrier, makes this dog to be quite unique making it a must have in every household. 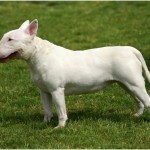 History suggests that the bull terrier originated around the 1860s in England.The dog was created as a result of a cross breed between the Bulldog and the Terrier as mentioned before. It was used as a fighting dog and was considered as a gentleman’s dog.With time it stopped fighting and focused on other attributes like sporting activities. He is sweet but tempered on the other hand. The dog is average in intelligence. He becomes easily bored if ignored. He is rowdy and clownish. He hungers of frequent playing and other activities. 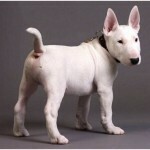 Bones do come in handy for Bull Terriers since they have powerful jaws and are able to chew and swallow in small bits. Dry kibble is also good for these dogs since it prevents from illness. To promote its healthy life, feed it in foods rich in nutrients like vitamins, proteins and carbohydrates. Just ensure you don’t have an overweight dog. By standing vertically on top of it, you should see his waist. Since they are friendly to people, the dogs should be kept indoors and well fed. Also, the dogs should be regularly cleaned to prevent them from flea attacks and so should their kennels. 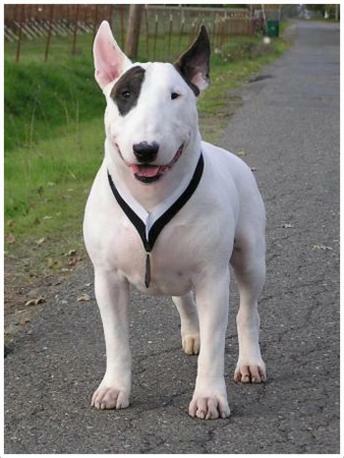 Bull Terriers are charismatic dogs. They love having fun by playing a lot and are quite gentle and very friendly to a lot of animals, just their fellow dogs who they may be jealous of. 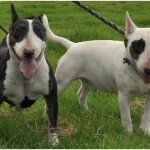 However, Bull Terriers can be stubborn, therefore, require experienced dog owners. 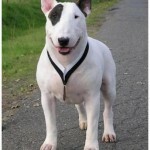 As stated before, the Bull Terrier is a cheerful and vivacious dog. It is exceedingly friendly and loves to have a lot of fun playing since it has enough athletic abilities which enable it to play very well. You cannot say no to this dog. It may be aggressive to other dog breeds especially if it was not exposed to socialize with them at a young age. 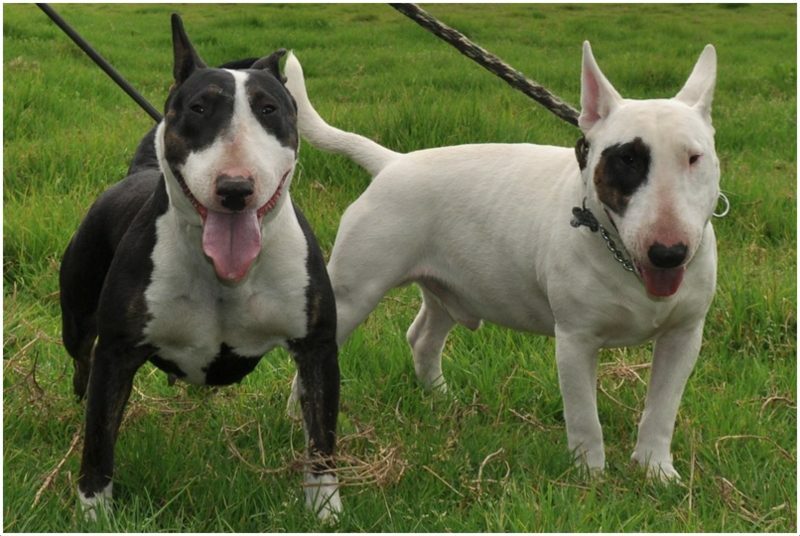 Since Bull Terriers are active dogs, they require maximum time for play and should not be restrained in their kennels for long hours.They should be given a chance to walk long distances but still caution should be taken if they still aren’t properly trained, they could run off and maybe that would be the last time you are seeing them. 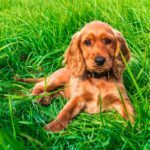 Due to the fact that it is exceedingly friendly, training the dog is a walk in the park [both literally and idiomatically]. But you should make sure you are strict during a number of intervals because it is easily carried away by its playful antics. They say it is quite hard to train this dog to live in the house while maintaining it neat and tidy because it is playful and doesn’t think twice on jumping anywhere and everywhere breaking stuff and all. On top of all, watch out for the Bull Terrier’s bark. Bull Terrier’s rarely bark except for good reason. 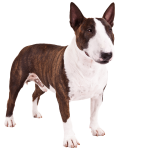 Pay attention to your Bull Terriers when they bark. 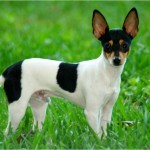 The life span of this breed is about 10 to 15 years. 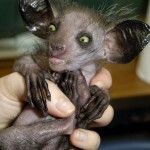 It is given birth and is breastfed by its mother for a few months. After that it starts playing around and can start eating solids. 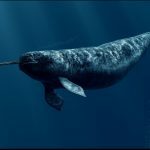 By the time it matures; it can eat the adult food and performs much moreactivities. This dog breed doesn’t face many predators especially because it is a very brave dog. Even though his size is somewhat small, he can stand up to anything and anyone. Ensure you get a reputable breeder who ensures the health of the puppies is in excellent condition when you are buying. 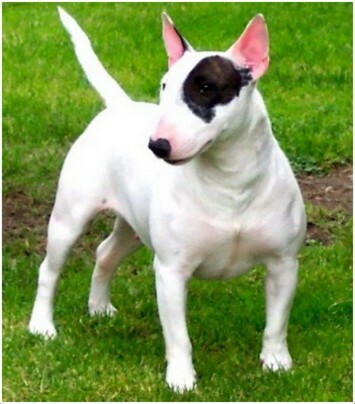 The Bull Terriers are described to have egg-shaped head since the top of its skull is flat and its profile curves downwards from the top of the skull to the tip of its nose, which is black and bent downwards .Its tail is carried horizontally and is generally white in color. 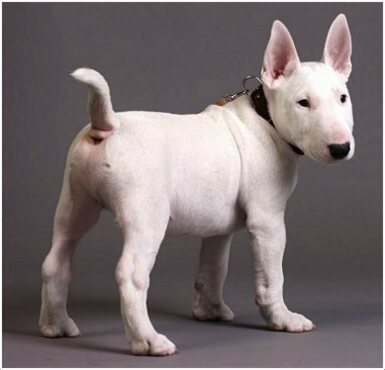 The Bull Terriers weigh between 50-85 pounds [22-38 kg] which is quite heavy. This somehow shows why they used to be in dog fights back in the day. It stands at 18-22 inches tall [45-55 cm]. 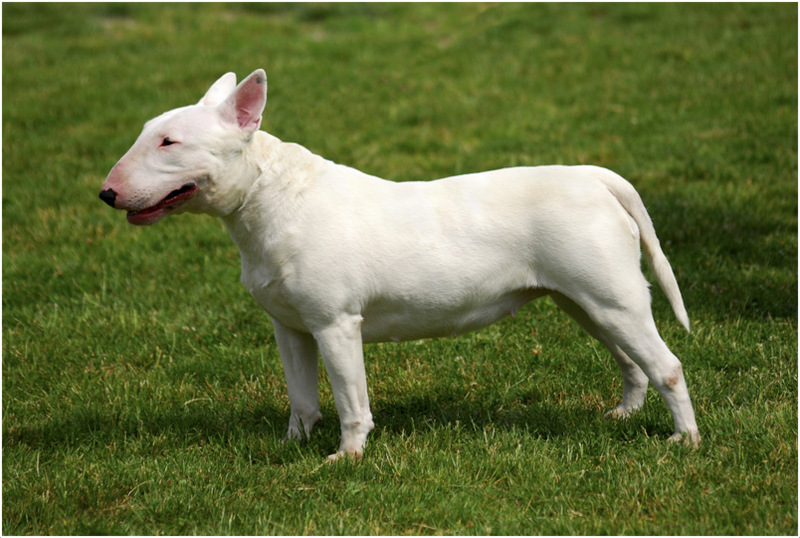 The Bull Terriers have a short, shiny and dense coat. 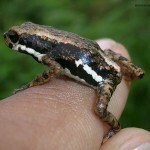 They are white, brindle, fawn or black in color. Sometimes they even have mixture of colors such as brindle and white. The bull terrier lives for about 10 years. Some can even go up to 15 years. This happens if you feed him well and give him medical attention as required. 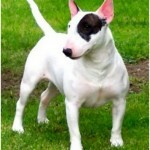 The Bull Terrier has a lifespan of 10 years with generally a healthy life. 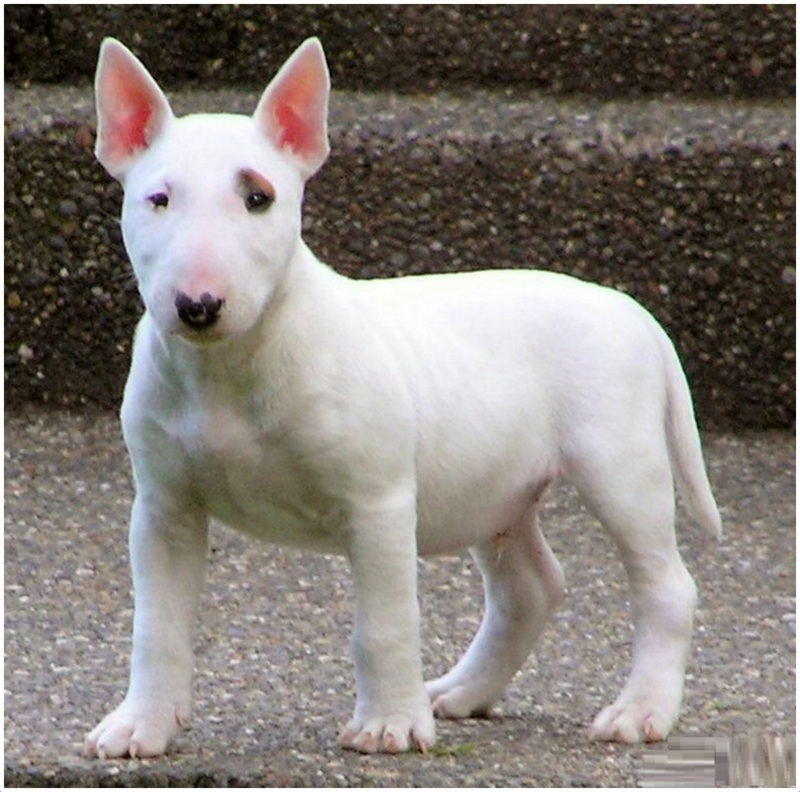 Bull Terrier puppies should be checked for deafness while still young because they are prone to experiencing deafness which may be unnoticeable among their owners. 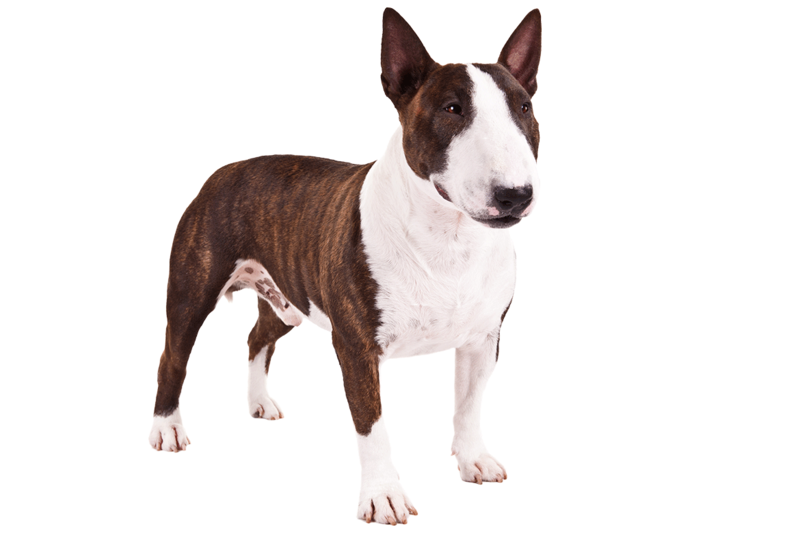 Also, bull terriers have tendencies of developing skin allergies due to insect bites of fleas and mites. This can be prevented by keeping the dog free from contact of such insects and regular bathing with the right soaps/shampoos to contain their allergies. Besides from these, some of the health problems that can occur include heart disease, spinning, nephritis which is hereditary and lens luxation. They are quite easy to maintain due to their compact coat. They don’t require regular cleaning. Cleaning and brushing once a week can be enough for them. You should try and brush his teeth about twice a week to avoid bacteria and tartar buildup. They shed their fur twice a year during a certain season. At this time, it is advisable to brush it daily. This helps contain the mess. It has no shedding coat and in the contrary, it is hard.